Interpreting the history of Wichita and Sedgwick County, and life on the southern plains, circa 1865 to 1880. Walk inside and around 39 buildings, 27 of which are actual, historic 19th Century buildings. Be amazed by the museum's collection of artifacts on display. Put on period costumes and take Old-Style Photos. Visit the Snack Bar in the Saloon (don't forget to get a sarsparilla). Watch gun-fight re-enactments on the dusty streets. Interact with costumed interpretors who look like they just walked out of a history book. Roam around Special Exhibits in the historic buildings. Take home souveniers from Cowtown's unique gift shop, featuring locally made items. 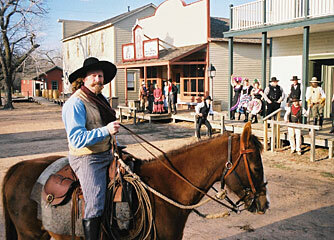 As a nationally recognized and accredited living history site, Cowtown offers a unique experience every time you visit. Cowtown also offers the perfect setting for any rental need. From a small get together in the Saloon, to an old fashioned wedding in the Church, to use of the entire Museum site, we have it all. Our Visitors Center can host elegant or rustic wedding receptions or corporate parties, as well. The reception hall features a huge stone fireplace and two-story, wood-beamed ceiling with fantastic views over the Arkansas River. Convenient, well-lit parking means your guests won't have to fight downtown nightlife and parking to get to your event. Let us know how we can help you plan your next party or event!